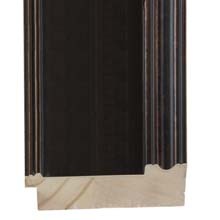 The deep brown and gold characteristics of this dark bronze wood picture frame, over a generally smooth and flat profile, that also features ridges along the inner lip and a concave cylindrical scoop along the outer edge, is an excellent pairing for interior design settings that feature warm or burnt orange and tan color tonalities. What is especially noteworthy about this dark bronze wood picture frame is the substantial size, which provides a commanding and authoritative presence to both large and small paintings alike. 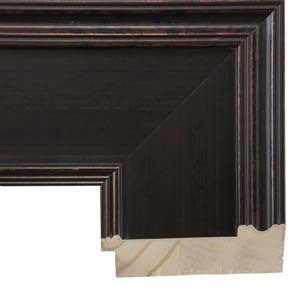 Another frame option that we offer that is similar to this frame is our closed corner picture frame CC66. The difference is that CC66 comes in readymade sizes only and features finished seams along the closed mitered corners, and V216 is a length moulding that we cut to custom sizes. For paintings, prints, and posters on paper, this dark bronze wood picture frame is wide enough to provide enough visual space for most imagery, without the aesthetic need for matting. However, if mats are essential to your design requirements, consider mats from our acid free line, such as Bruxelles 9853, Fossil 9511, Top Soil 9591, Fresh Brew 9590, Coffee Bean 9842, Black Belt 9632, and Sienna 9818.